With all of the “salesy” information out there about the benefits of having a tungsten wedding ring, you could be forgiven for thinking that they’re near invincible. As much as we’d like to tell you that they are, it’s simply not true. It is true that tungsten is the hardest metal in the world, and it is true that they are more scratchproof than any other metal used in jewellery today, but there are a few drawbacks that you should know about before purchasing a tungsten wedding ring. Most super hard materials are also brittle. That is why diamonds can be cut and shaped, and is also why a pure tungsten wedding ring may not scratch, but will shatter when dropped on a hard surface. You may have noticed that most tungsten jewellery is actually referred to as tungsten carbide. This is because carbon is added to the tungsten, which stops it from being so brittle. Even a perfectly mixed tungsten carbide ring may still shatter under the right circumstances though, so it’s important to be aware of this before making your purchase. For the most part, if you drop your tungsten carbide ring on a hard surface, it will just bounce, and not bend, dent or scratch. On rare occasions though, it may chip, or even break. So if you are the kind of guy that regularly drops his ring in the shower, you might want to consider taking it off before you go in! There is an important benefit to this quality though, that can turn it into a feature and not a drawback. In high impact situations (like a car accident), most soft metal rings will bend onto the finger, restricting blood flow, which can lead to the loss of the finger. 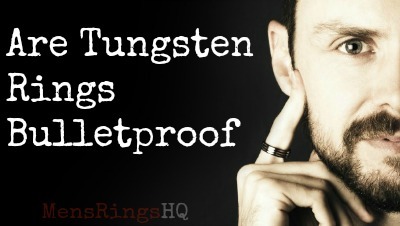 Tungsten rings won’t. They’ll either hold up under the pressure, or they will break off the finger after absorbing some of the force, thereby making them safer rings to wear. We have also tested our tungsten carbide rings in an Emergency Room of a local Hospital, and have had one cut off using their equipment (which actually has a tungsten carbide blade!). Like every other metal or material used in Men’s wedding rings, tungsten carbide most definitely has its place. Alongside only Zirconia Ceramic for hardness, tungsten carbide rings are the only metal wedding rings that will look the same in ten years time as the day you bought it – but you still need to you look after it!